A while ago I was waxing nostalgic about writers I miss. 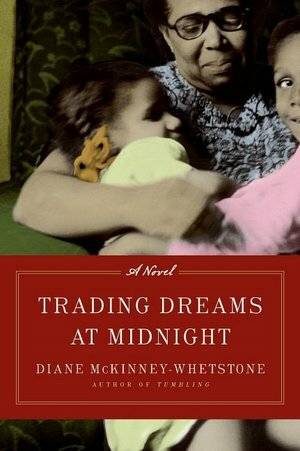 Diane McKinney-Whetstone is on that list, so when I ran out of audio books, I picked up Trading Dreams at Midnight even though I'd already read it. I really believe that you learn or hear new things when you go back and read or listen to books you've previously read. I don't remember being as intrigued with the family dynamic before, but this time, I was blown away. Trading Dreams centers around two sisters, Trish and Neena; their mother, Freeda; and their grandmother, Nan. Like so many that migrated from the South, Nan came to Philadelphia in search of a better life. What she found was Alfred, a pretty man with a penchant for drinking. What she got from him was a daughter. Freeda was a strange child and an even stranger teen. While Alfred tried to explain it away, Nan suspected that her daughter was mentally ill. I think, to some degree, Alfred knew she was, because he heard voices in his head just like Freeda. He drank to keep the voices at bay, while Freeda hadn't yet found an outlet. Freeda's demons drove her out into the streets, only to return to Nan with the birth of each daughter, Trish and Neena. Freeda tried to stay and be a good mother, but the voices that told her to kill her daughters sent her away for good and the girls found themselves staying with Nan. As the eldest, Neena had more memories of the good times with Freeda. So it only makes sense that she's the daughter that feels the abandonment more deeply. Each girl deals with Freeda's departure in different ways. While Trish dives deep into books, church and social clubs, Neena takes to the streets to find her mother, chasing one lead after another, only to return when money has dried up. I found myself so angry and upset with Nan. As she watched Neena mirror so many of the same mistakes Freeda made, she never stepped in to offer words of encouragement nor was she truthful about Freeda's whereabouts. As a teen and adult, Neena seemed to bear the brunt of Nan's anger about, and disappointment in, Freeda. While Freeda's disappearance had an effect on the girls, Nan's actions toward them affected them just as much. Weeding Neena and watering Trish led to two very different lives for the sisters. As college dropout Neena wandered the country, blackmailing married men for money and searching for Freeda; degreed and happily pregnant Trish married the love of her life and worked her dream job. A single statement from Nan could have put Neena on the same path. Just as maddening as Nan's silence during Neena's search for Freeda is the wedge she's determined to drive and keep between the sisters. Upon Neena's return to Philadelphia, she's trying to locate her sister. Nan refuses to tell her she's in the hospital because her pregnancy is at risk and she doesn't want Neena to upset Trish. My grace, Nan, have a thousand seats already! At no point was I ever given the idea that Trish didn't want her sister around. Neena wasn't a crackhead, thief, Freeda reincarnate or any other imaginable reason I could think of for Nan to keep her away. She was just a controlling old biddy. Interestingly enough, Nan was no angel in her heyday. And that's the beauty of McKinney-Whetstone's writing, her characters are human. While they may want to believe that they're beyond reproach and have always lived saintly lives, they're not and McKinney-Whetstone is going to peel back enough layers for you to see that. I would have liked to hear more from and about Trish. She was a central part of Neena and Nan's lives, but didn't really have a voice in the story as a child or adult. Instead, she's like an inanimate object that gets tossed around by Nan, Freeda and Neena like a group of kids playing Hot Potato. We're given a brief look into her current state in the hospital, but nothing more. Overall, this was an enjoyable listen and I got so much more out of it this time around.